Imagine having to build a bridge — a strong bridge — out of nothing but epoxy and spaghetti. Yeah, hard. Just ask one of the 160 high schoolers who recently finished Engineering Innovation, a rigorous, monthlong summer camp run by Johns Hopkins University in Baltimore and a handful of other cities. They didn't just have to imagine it; they had to do it. 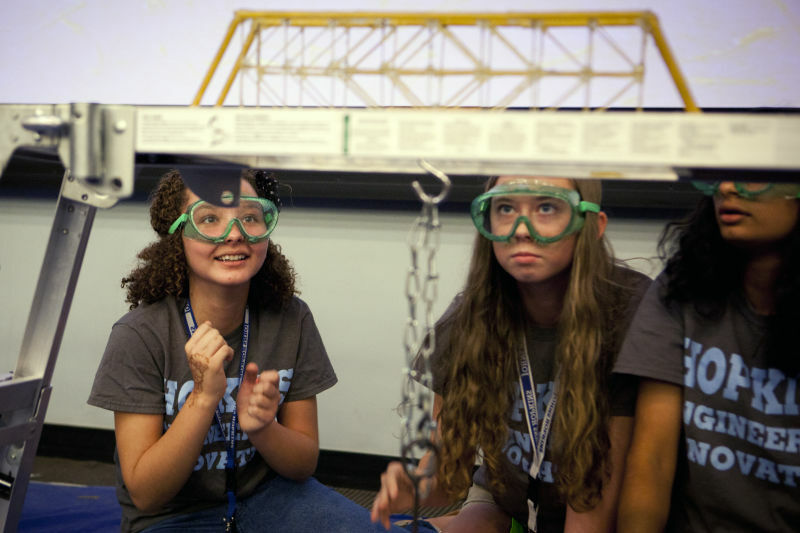 Students come from all over the world to get what is, for many, their first real taste of engineering in the classroom. The idea behind the program is simple: Give students a chance to explore complex ideas using remarkably simple tools. "They've heard of engineering, but in high school they know almost nothing." Example: Measure the distance between two spires on the Hopkins campus using nothing but a few measuring sticks, string and tape. Students also have to design a mousetrap out of nothing but paper, glue and rubber bands. 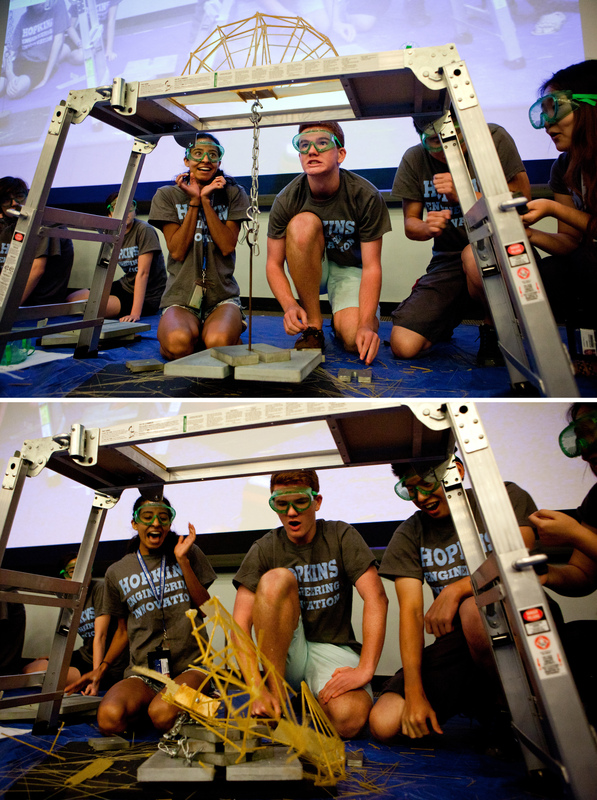 But the grand finale — the last big test for students — is the spaghetti bridge. "I'm so scared right now," says Bidyut Mani, 16, playfully cringing as his team begins adding weight to their bridge. It's the last day of camp, and Bidyut's team, Penne For Your Thoughts?, sits onstage in a campus auditorium surrounded by classmates and parents. Bidyut's on edge because students here are graded, and those who finish the month with at least a B-average earn three Johns Hopkins engineering credits. Bridges can weigh no more than half a pound and have to be made of spaghetti or other solid, cylindrical pastas — like capellini or vermicelli. Too tall (over 10 inches) and points will be deducted. Ditto a bridge's weight. Anything over that half-pound and judges impose a stiff penalty. Onstage, teams set their bridges over a 20-inch gap, hang a chain from the middle and begin ever-so-gently attaching weights. "They've heard of engineering, but in high school they know almost nothing," says retired professor Michael Karweit. He designed the camp's curriculum, hoping to give promising high schoolers with an interest in engineering a chance to "get dirty, so to speak." And that's exactly what campers were doing the day before the competition, in the last frantic minutes of the allotted bridge-building time. "We're barely 1 gram under weight," says Bidyut, feeling more relaxed after a trip to the scale. "The epoxy takes 24 hours to dry and cure," Amelia says. "And so we only have not 24 hours before the actual competition." First: The engineering equivalent of a safe bet, in this case, was the half wagon wheel. It's strong, with all of its supports focused on the center of the bridge where the weights were hung. Keep in mind, this is a terrible design for an actual bridge that will need to support weight equally across its length. Second rule of bridge club: Triangles = strength. Third: Some crafty students glued spaghetti strands together into hollow tubes — for the sections of bridge that would be compressed by the added weight. Because strength, in that case, comes from diameter not solidity, and keeping the tubes hollow saved weight that teams could use elsewhere. So, whose pasta masterwork ultimately won the day? Mani's Penne For Your Thoughts? did well, holding 15 pounds. While Hawley's team — Foxy Epoxy — tied for third place with a whopping 26 pounds. But the winner, from Team A'hunna Key-Lows (A Hundred Kilos, get it? ), held a mind-bending (but not bridge-bending) 53 pounds. Spaghetti and teenagers ... it's amazing what they can do under pressure.